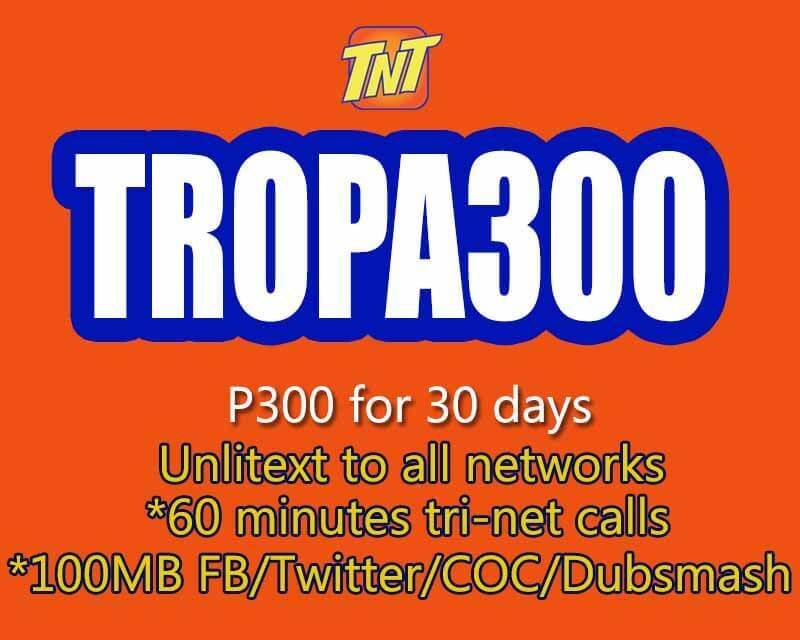 Here’s another affordable promo from Talk N Text called TROPA300. You can enjoy more that text and call as you can also access to the internet with your favorite social media apps like Facebook, Twitter, Dubsmash and more. With your 300 pesos for 30 days, you can get unlimited text to all networks, daily limited trinet calls (Smart, TNT, Sun Cellular) and 100MB of mobile data. The good thing on this load is that you have a daily allocation of data and calls that expires every midnight. Even if its limited, MB and call will renew every day so you can still access to the internet and use the call daily. For now, you can register to this promo via SMS keyword. You can also ask your load retailer if it’s they can load TROPA300 directly to your mobile number. Additional tip: If you want other cheaper internet promo try GAANSURF150 for 30 days. 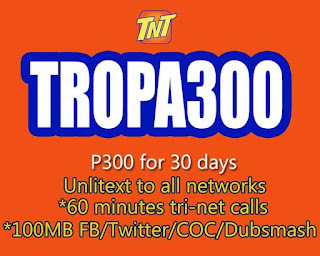 The TROPA 300 is really a good offer if you need calls, text and Facebook access. For the whole month you get 3GB of data and 30 hours of call plus the unli all net text all for Php300.00. After you successfully register to this promo, wait for the SMS notification from TNT before you start using the TROPA300 promo.